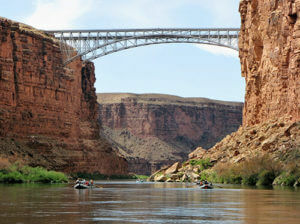 GCW oar boats travel under Navajo Bridge. 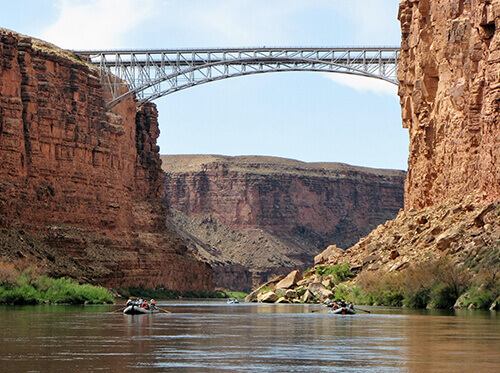 In the late 1800s, the only place to cross the mighty Colorado River in the Utah/Arizona area was in Glen Canyon where a small ferry was established by John D. Lee. This was really the only place in some 800 miles for people to easily cross the river. In the 1920s, it was decided that a bridge needed to be built over the river to replace the ferry. In 1929, the bridge was opened to traffic making it, at the time, the highest steel arch bridge in the world. As Prohibition was in effect during that time, a bottle of ginger ale was used to christen the new bridge. Over the decades, the amount of traffic on the bridge increased as did the size of the passenger vehicles and trucks using it daily. After 66 years, the decision was made to replace the bridge and build a new one directly next to it. The historic bridge was preserved as a pedestrian bridge to allow guests to safely view the river. In the early 1990s, construction on the new bridge began and was finished in 1995. As construction took over two years, the workers had to figure out a way to protect the thousands of rafters that would pass under the site. A net was strung under the bridge as a way to catch falling debris. Keeping in the tradition of interesting christening, this second bridge was christened with none other a bucket of chilly Colorado River water.